Sorry Bamba - Du Mali. Vinyl LP. Bleep. 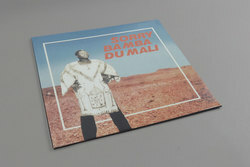 One of our favourite reissue labels of the moment drop their latest release, a fully restored and faithful reproduction of Malian composer Sorry Bamba’s 1977 French press afro-funk grail Sorry Bamba Du Mali. Pre-dating the drum machine zouk trend of Frances ‘world music’ record industry in the 80s, Bamba’s second album for the Parisian group Sonafric is wonderful, organic latin jazz/r&b inspired venture. ‘Porry’ is an unbelievably good 11 minute opus which is equally suited to kitchen listening as it is open air outdoor festival sets. Top stuff!